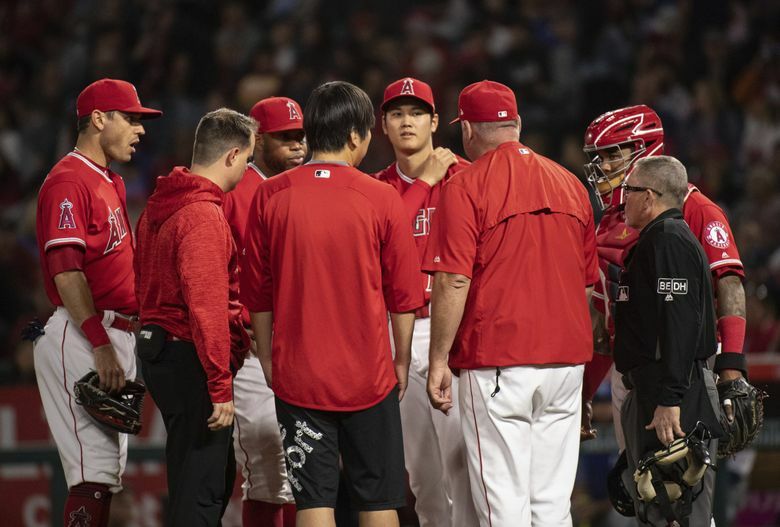 Angels general manager Billy Eppler denied Monday that the team has made a decision on Ohtani's treatment, but a report said the Angels are worried that Ohtani's UCL sprain has progressed to a full tear that would require Tommy John surgery. The Angels placed Shohei Ohtani on the disabled list Friday because of a Grade 2 sprain to his ulnar collateral ligament, saying they would reevaluate his situation in three weeks. We might not see the two-way Japanese sensation on the field until well after that. ESPN’s Pedro Gomez reported Sunday night that the Angels are worried that Ohtani’s UCL sprain has progressed to Grade 3, a full tear that would require ligament replacement surgery (a.k.a. Tommy John surgery) and a lengthy rehab process. Angels general manager Billy Eppler, however, denied Monday that the team has made a decision on Ohtani’s treatment. “There have been no changes in Ohtani’s diagnosis and neither our physicians nor medical staff have recommended [Tommy John surgery] or said it’s likely,” Eppler said, per Ken Rosenthal. Ohtani, the first two-way MLB pitcher in decades, is 4-1 with a 3.10 ERA on the mound and is hitting .289 with six home runs, 20 RBI and a .907 on-base-plus-slugging percentage in his first season of U.S. baseball. Days after he signed as a free agent with the Angels in December, Yahoo reported that Ohtani had a Grade 1 UCL tear but Eppler said at the time that there were “no signs of acute trauma” in the ligament. Ohtani’s devastating split-finger fastball is a pitch that puts significant strain on the elbow. If Ohtani needs to undergo surgery, he likely wouldn’t be back until 2020. Eppler told reporters in a conference call Thursday that Ohtani underwent injections of platelet-rich plasma and stem cells Thursday in Los Angeles, a treatment used to aid the healing and regeneration of soft tissues such as tendons and ligaments. He won’t throw over the three-week period until his evaluation. “I’m just going to take every day as it comes and put him on this course of recovery and strengthening for the next three weeks and then deal with what we’ve got to deal with in three weeks’ time,” Eppler said during the conference call, per the AP. The 37-29 Angels are 7-3 over their last 10 games and sit 4.5 games out of first place in the AL West. This story was originally posted on washingtonpost.com. Read it here.